Tails of Equestria: Gamemaster’s Bundle! 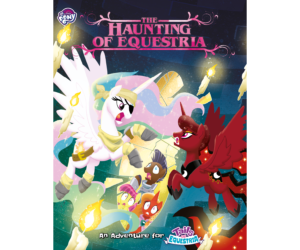 Get yourself two incredibly helpful books that can expand your Tails of Equestria games with new creatures, new locations, and new playable races! The Bestiary of Equestria and The Official Movie Sourcebook are the perfect second step for any Tails of Equestria Gamemaster. The Bestiary of Equestria is an expansion book containing loads of monsters, magical creatures, and friendly faces for use in your adventures. Each entry contains images, descriptions, and in-game stats, allowing you to immediately drop a menagerie of characters and creatures into your Tails of Equestria game. The Official Movie Sourcebook is a companion to MY LITTLE PONY: THE MOVIE, expanding on the new characters and locations featured in the film, and giving you a huge amount of advice, game stats, and details to improve your adventures, and allow your characters to roam far beyond the borders of Equestria. With this book, players can choose Cats, Parrots, Hippogriffs, and Lizardfolk as playable races, and you can even learn how to transform into a Sea Pony! Terminator Genisys: Rise of the Resistance Tails of Equestria: Get Started Bundle!